Frank Sinatra is probably the most famous and popular singer in history, and brought a totally new dimension to live performances. As a Las Vegas legend, he definitely helped "put it on the map!" 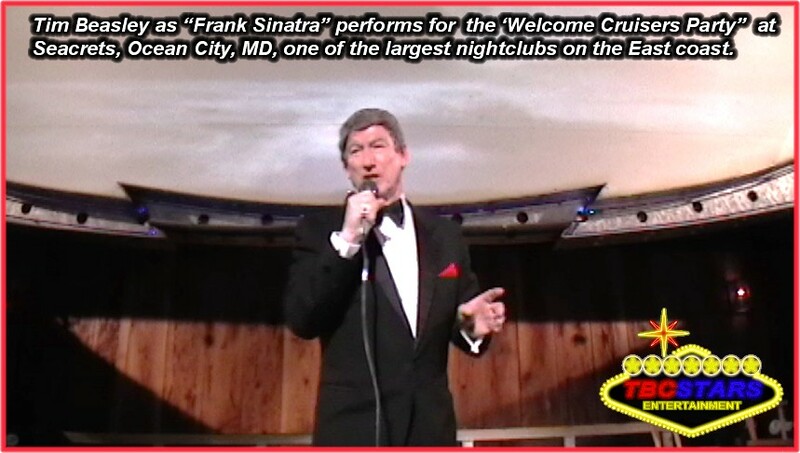 His reign at the top casinos and resorts in the 50's and 60's brought out all of the entertainment royalty to join him in this spotlight power. 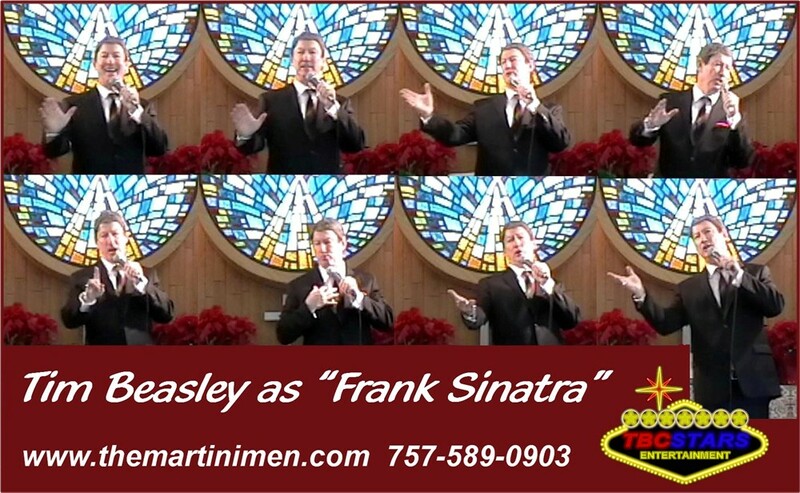 Our "Frank Sinatra" tribute swings with all of those great hits you love and remember! 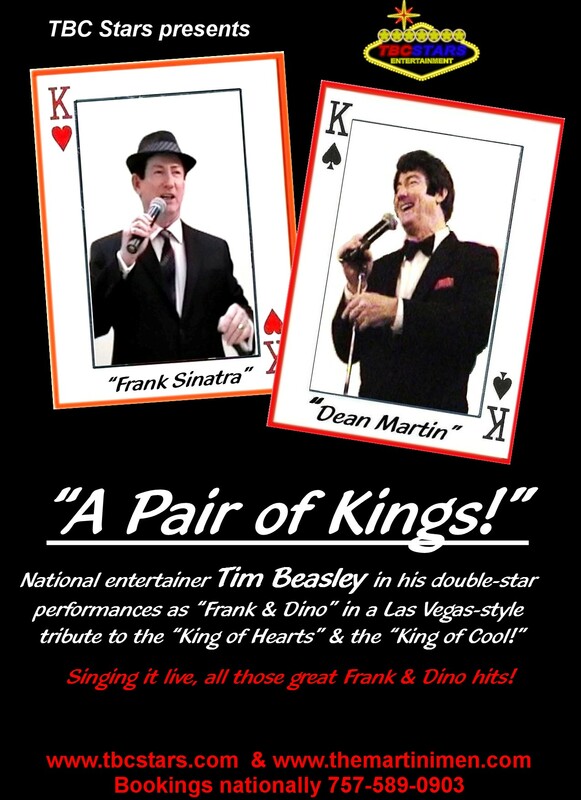 Either as a superstar solo performance of from 30 minutes, one hour, or up to 90 minutes, or grouped together with any number of the other "Martini Men," Dean, Bobby, Tony or even all four together in a one-man show spectacular, it makes a grand evening of "Martinis & Memories!" 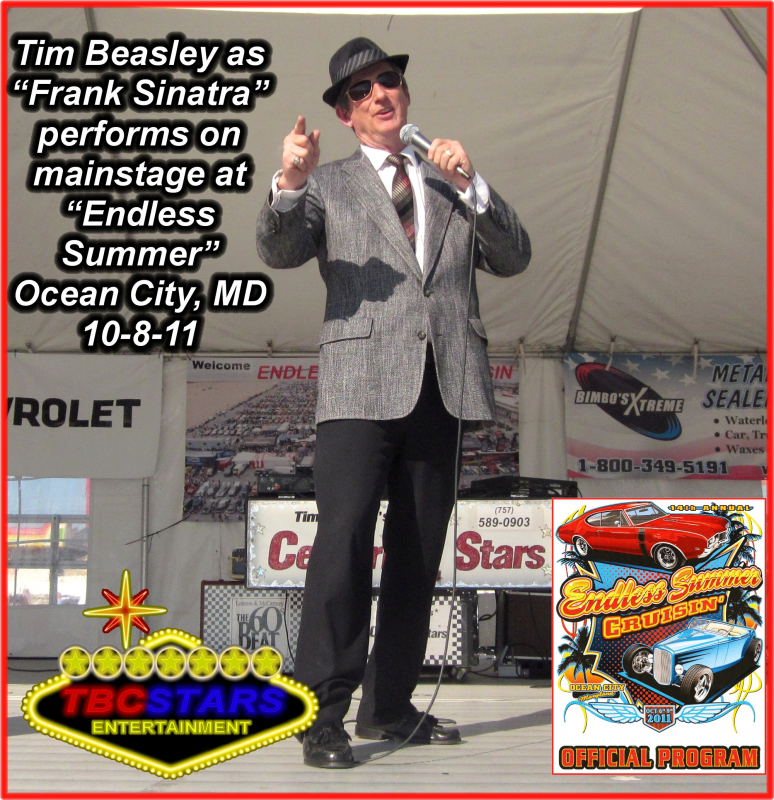 Show is performed with Tim Beasley singing live vocals, in impression of Frank's voice and range, and a visual impersonation in his stage presense, similar build, hair and facial features accented, and sharp suited appearance, and sings into a professional Shure microphone on chrome stand. The live vocals are mixed with prerecorded "backing tracks" from a CD, or similar media to effect the sounds of a full orchestra, and reproduce the legendary live shows Frank Sinatra was known and loved for. The professional sound equipment needed for a great show in a smaller or medium-sized venue to entertain 35-350 guests is very basic, of about 1500 watts, and can be provided in a drivable range which is normally about a 350 mile radius from Virginia Beach, VA. We also have the professional theater lighting and even special effects lighting to give a very sophisitcated look to the show. All equipment is top brand, and attractive in appearance with a "Las Vegas" motif. 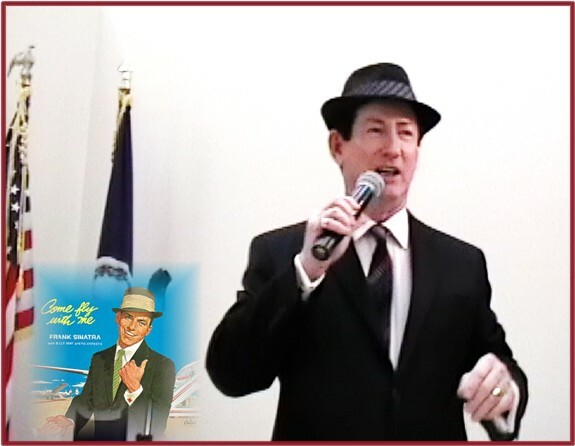 As this is a one-man show, the performance is conveniently compact in stage area needs, so works well either on full stage or minimum of 8' X 10' but very high in visibility and feel. For engagements nationally, flying in for the engagement, if the show is for an initimate party of up to 35 guests, we bring a portable professional sound system that works great for those, but for a larger group, such as 35 -350 guests in a hotel ballroom or banquet hall, we suggest the Audio / Video dept at hotels and resorts venues provide the set up for the show, or have a sound re-enforcement sub contractor or DJ company do this. .
"Luck Be A lady Tonight"
"New York , New York"
Be sure to see the videos on the "Multimedia" tab! 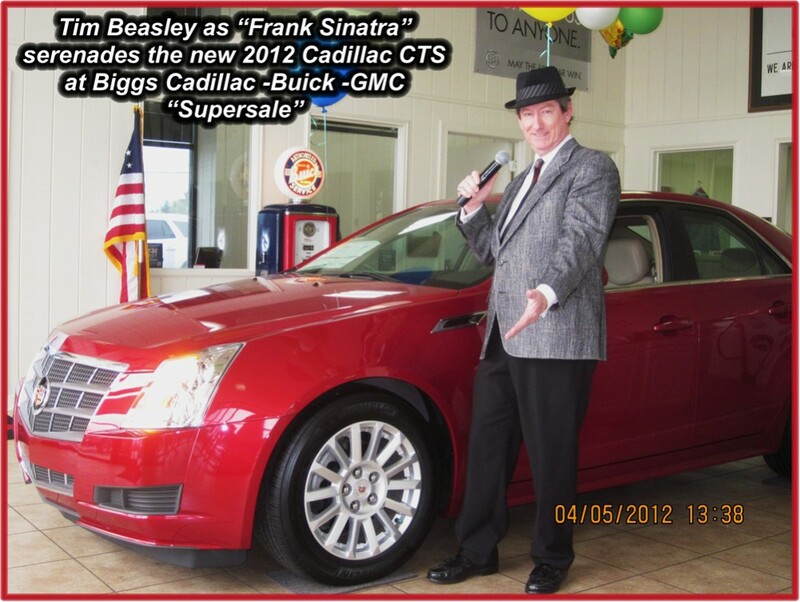 Copyright ©2012 - Tim Beasley - The Martini Men- All Rights Reserved.